How fast will this go? As long as I can remember I have been fascinated with anything and everything that can fly, race, drive, make a noise or go fast. Back in the early 80s when I was growing up this was still a domain generally reserved for boys, but that didn’t bother me. My fascination with ‘fun things that moved’ began with my rocking horse at the tender age of one, followed by ‘rides’ on my aunt’s horse when I was a mere toddler. 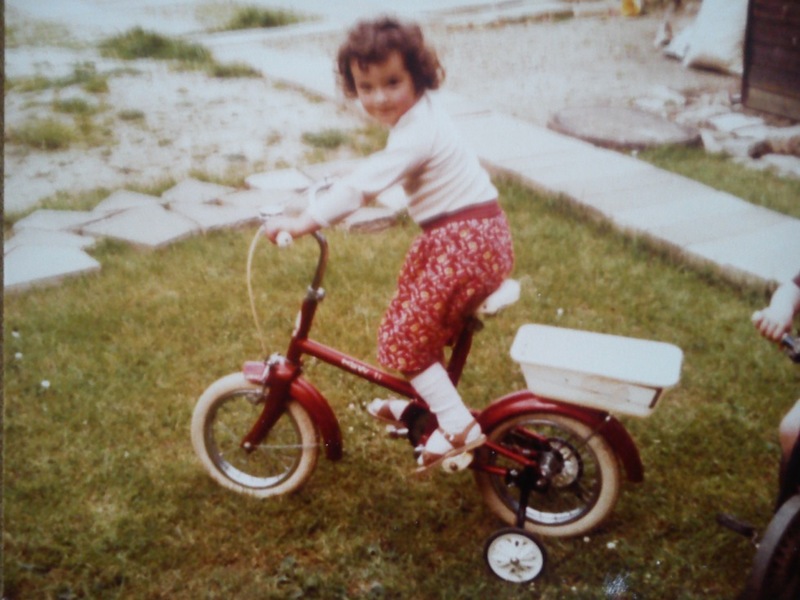 This progressed onto a scooter…bicycle with stabilisers, bicycle without stabilisers and then at four years old I remember flying to Jersey in a real-life aeroplane!!! Shortly afterwards, I found a love for rollercoasters when I was lucky enough to visit Disney World Florida at 11 years old. 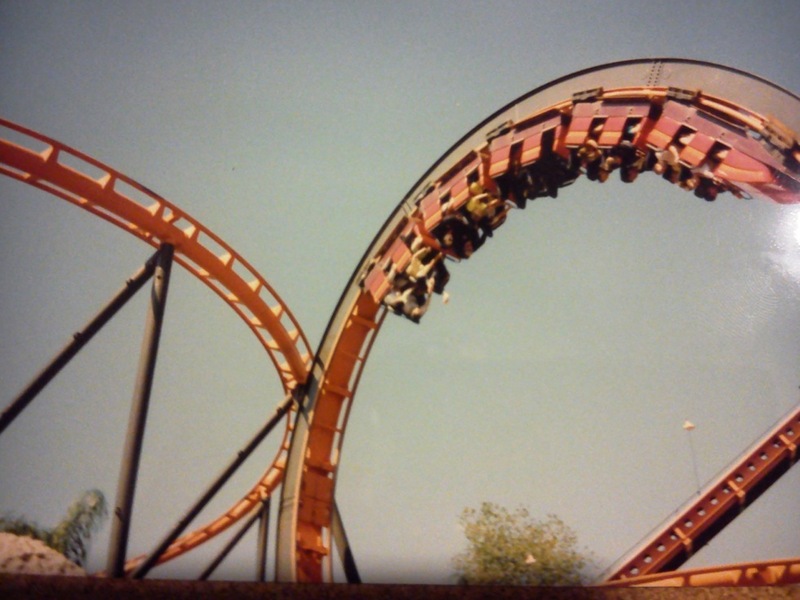 Wow, the feeling of butterflies as we slowly crawled up the big dipper and then the adrenaline as I was weightless for a millisecond before the rollercoaster hurtled at 80mph down the steep track, my body sustaining 2, 3 possibly 4 Gs!! Now THAT was the ultimate thrill. And, until I was 17 I stood by the rollercoaster as the most exciting experience a normal person could have in a moving object. Learning to drive then took over, although the immediate thrill of being in control of a motor vehicle was soon replaced by the feeling of independence and responsibility. Although I have to confess to dating a boy in Sixth Form just for the chance of rides in his revvy Ford Capri! Boat tests, filming and press conferences exposed me to such experiences as three days living on a 60-foot offshore powerboat chasing the Whitbread Round the World Yacht Race from La Rochelle to The Solent; filming on Peter Stringfellow’s superyacht with Jeremy Clarkson for Top Gear Waterworld (remember that series?) and the thrill of a private helicopter transfer in a fully-glass cockpit R44 from St Tropez to Nice Airport. At 21 my real passion for motorsport began when in my first year as Press Officer for Toyota GB I was sent on various track days and risk assessment driving courses in the latest Celica, MR-2 and Lexus GS300. I learnt a great deal about handling a car in the wet, black ice, what it felt like to do an emergency brake at 100mph (terrifying) and how to handle a rear-wheel drive sports car. My interest in engines and an appetite to understand the technology behind machines stems from growing up with a father whose profession is an avionics aircraft engineer. This interest was further encouraged in my first few weeks at Toyota when we were launching the pre-production version of the Prius to the UK media. This involved me explaining the Toyota Hybrid System to a Newsnight researcher, which was my first lesson in how to handle generalist versus specialist media. Toyota launched the Panasonic Toyota F1 Team during my employment with the brand and this exposed me to the wonderful event that is the Goodwood Festival of Speed and working first hand with an F1 team on PR and filming. As a car enthusiast you can’t quite beat the thrill of standing next to an F1 engine revving its engine, this is enhanced by knowing that the media filming it are there because you invited them, always a result for a PR person. During this time I met one of the F1 team’s telematic engineers for driver Olivier Panis, 30-year old Gill Hall who had studied at Newcastle University. It was my job to join the team testing at Paul Ricard Circuit for filming with BBC Newcastle, and I found it so inspiring to meet a young woman who had succeeded in a male-dominated environment. It gave me a further determination to achieve greater things. Click here to see the news story we did. 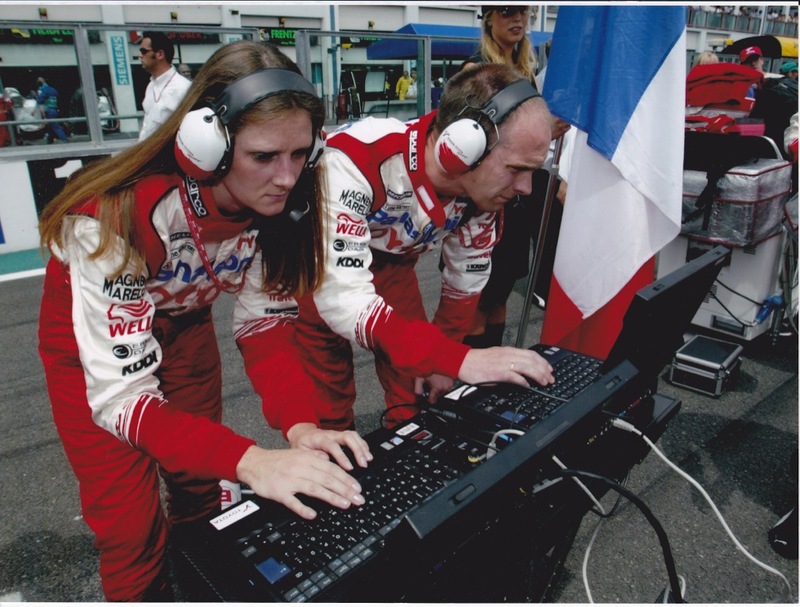 In 2003 I joined Mazda, under PFPR Communications initially, where my motorsport experience continued with the RX-8 Formula Woman Championships. 10,000 women keen to become racing drivers were drilled down to 1,500 that we put through track tests, media interviews and health tests at 10 circuits across the UK. I met young racing driver Phil Glew who gave me a 3-lap spin in the MX-5 around Brands Hatch and whet my appetite for more track time whenever I could. RX-8 track experiences followed with demonstrations from Mazda racing drivers Mark Ticehurst, Owen Mildenhall (also Road Test Editor at Auto Express) and Mike Wilds who competed in F1 in the 70s and has raced in the Le Mans 24 hour over seven times!! Five..or perhaps six Britcar 24 hour endurance races at Silverstone followed in my 8.5 years working with the Mazda brand and countless smaller endurance races where my role was looking after the drivers, understanding what is going on with the car via the technical team and communicating this to the ever-watching media. As my motor industry colleagues will know, my boss at the time was PR Director for Mazda UK Graeme Fudge who is a Private Pilot’s Licence holder and whether by luck or design, Mazda became involved in aerobatic events. In Spring 2007 I was sent down to Kemble Airfield in Gloucestershire to accompany journalist Chris Rawes from Crown House Media recording an interview about ‘What Zoom Zoom means to you’, while he had an aerobatic flying experience in a highly-capable aerobatic aeroplane the Extra300. 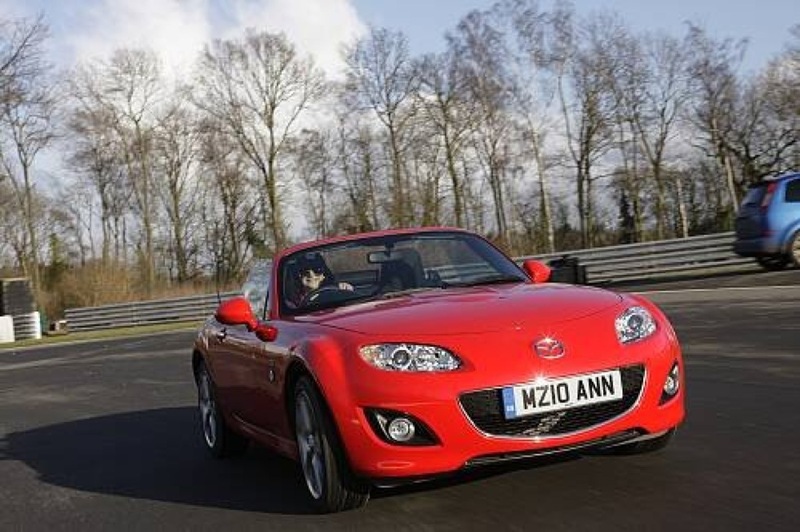 Unbeknown to me, part of my press event ‘preparation’ was to experience aerobatics myself, presumably so I could tell all the journalists how amazing it was and they should all attend our RX-8 launch to experience the ‘Zoom-Zoom’ thrill themselves. What I didn’t know then was that my 20 minute flight with Mark Greenfield, ex-RAF pilot and CEO of aerobatic experience company Ultimate High, was to become a turning point in my life. As we took off in a vertical manoeuvre I remembered that first ever rollercoaster experience at Disney World and when Mark said: “You have control.” I took the control of the aeroplane and performed my first aerobatic manoeuvre. I was hooked from that point forwards. It was THE most thrilling experience. 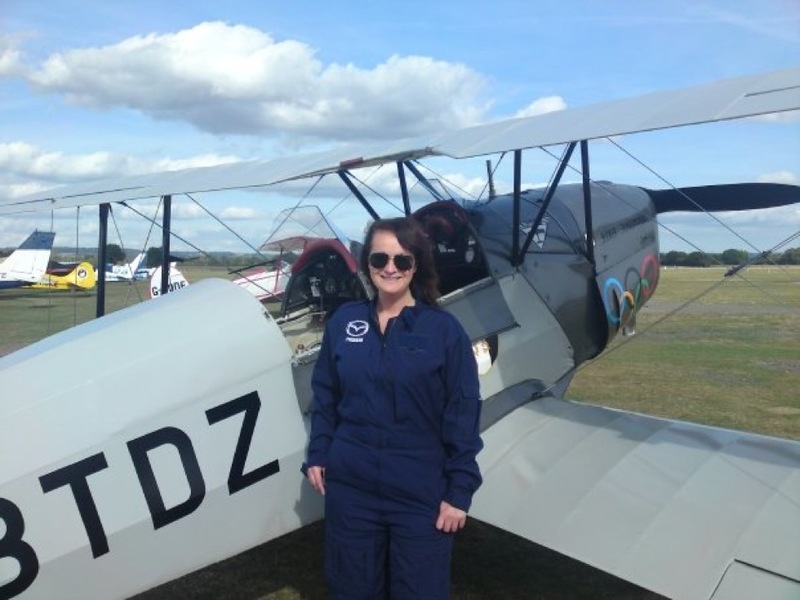 I had a dozen or so aerobatic flying lessons over the next three years and by the time Mazda sponsored the World Aerobatic Championships at Silverstone in 2009, I knew I had to follow my passion to get my pilot’s licence. I was also fortunate enough to work on several aerobatic events, which exposed me to some very experienced aerobatic instructors including ex and current Red Arrows pilots. Every one of them told me to follow my dream and get my wings. One of the most inspiring pilots I met was a 25-year old American stunt pilot Melissa Pemberton who’d been taught to fly by her grandmother. 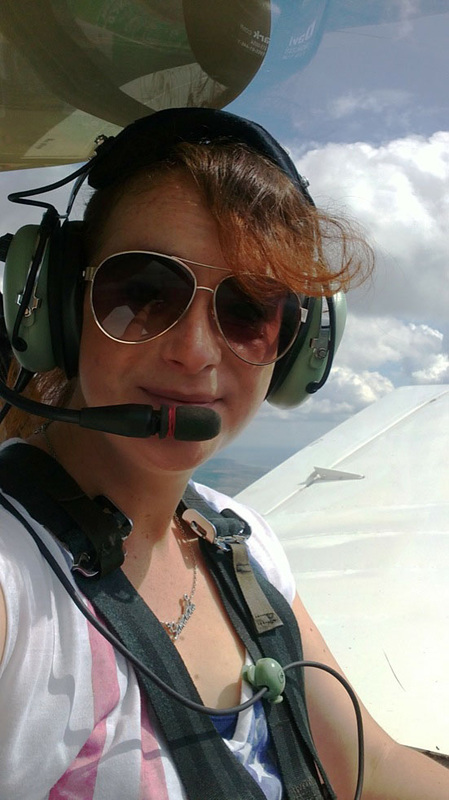 From my first solo flight on 11 August 2010 at 19:15, I felt an overwhelming sense of freedom and seeing the world from a slightly different perspective. I obtained my Private Pilot’s Licence in April 2011. As part of the syllabus for I had to sit seven ground exams. I am proud to have achieved 96% for aircraft technical (how could I not working for a car company and with a father as an aircraft engineer)? At present I am flying mainly Robin DR400s and Cessnas for touring with flying club friends. I also plan to complete my Tailwheel conversion to eventually fly vintage aircraft such as the DeHavilland Tiger Moth and fulfil the promise I made my grandfather to fly this wonderful aeroplane solo, something he never achieved, but always wanted to do. 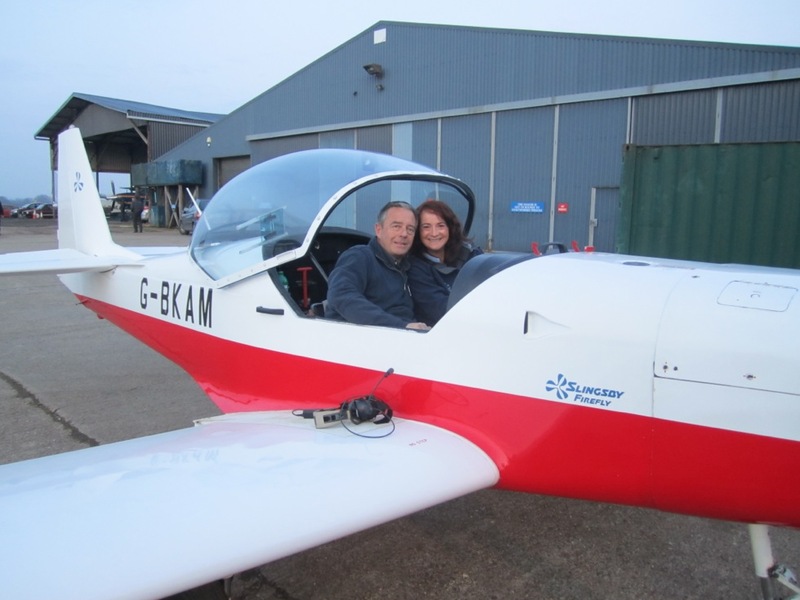 When time and money allows I grab my friend and former British Aerobatic Unlimited Team pilot Richard Pickin for some aerobatics tuition in a T67 Slingsby Firefly 160hp. Aerobatics isn’t just about the thrill, it teaches a pilot how to recover from unusual attitudes and it allows you to become a safer pilot. Not dissimilar to the advantages of track driving to improve one’s on-road driving skills. Money no object I would fly aerobatics and train to become a display pilot – unfortunately air show pilots do not do it for the money, simply the joy of flying. 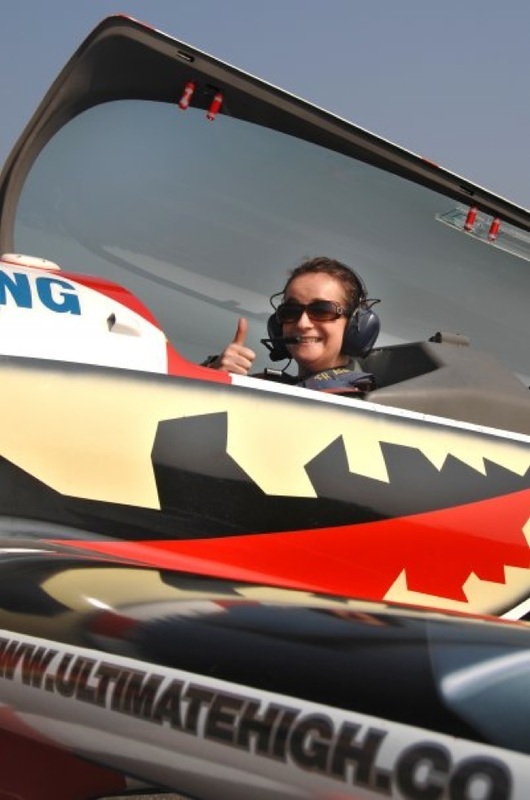 Although some have been lucky enough to do it for their careers, such as my friend Ft Lt Jules Thurston 2011 RAF Hawk Solo Display Pilot, who coincidentally was also a Formula Woman Racing Driver! Flying is about the same cost as playing golf so it can be expensive, but like anything you can budget for what you can afford each month. That’s why I buy a few less pairs of shoes and handbags than perhaps I would like! My money is spent on new flying kit and warm socks for hanging around the airfield in the winter. The strange thing about learning to fly is that it opened up my opportunities and experiences for my public relations career. 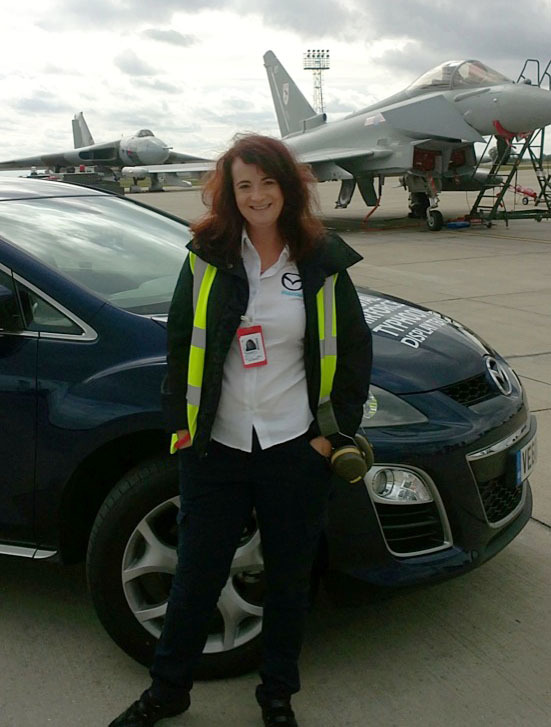 Through Mazda’s sponsorship of British Aerobatics and the RAF Typhoon Display Team in 2011, I had the opportunity to learn a great deal about promoting aviation. Coupled with my experience as ground crewing for the Tiger Club’s barnstorming-style Turbulent Display Team (see www.turbteam.com) and in two years I became well rehearsed in commentating, air show organisation and had some great contacts in aviation media. In February this year when I, like many other motor industry colleagues, faced redundancy as Mazda was forced to make European-wide job cuts, (a direct result of the strength of the Yen versus the Euro affecting profitability and the fall-out for Japanese car manufacturers following the March 2010 tsunami), I found myself excited at the prospect of having the freedom to become a freelancer. So, within a month I’d chosen a company name, set up a website, worked my contacts and had three clients on the books. Revved Up Communications has been running for almost a year, and 40 press releases, 12 published feature articles, three radio interviews, two TV interviews, 10 clients and not much sleep later…I am loving every minute. So call me what you like…car nut, av geek, PR floozy. I don’t care. I am passionate about cars, planes and all things moving. I am lucky enough to earn a living from writing about, promoting and experiencing these wonders of technology and will pass on a day out shopping for a flight or drive. What next? Maybe I should get my ARDS licence...now when did Mike Wilds say he had a free day…. Blue skies and open roads!